With Kim gone for the day, and me being between work trips, I decided to take a couple hours off from work in the afternoon to finally get some time in the garage. My goal for the day was what I now know to be … overly optimistic. I went into it thinking I’d get through the steering rack and front suspension on the first day, the manual looked to be so simple, just bolt this bolt that, and you’re good. Well… it’s not quite that simple. To start the day off I snapped a couple pictures in her pristine state. She’ll never not have parts on her after today. Sentimental… or just mental… I don’t know. First step of the day was to cover the front in tape to protect it from scratches. Picking up the roll of blue painters tape I got to work. And when I was done, I realized I may have been a bit overzealous. I hit every nook and cranny with the tape. 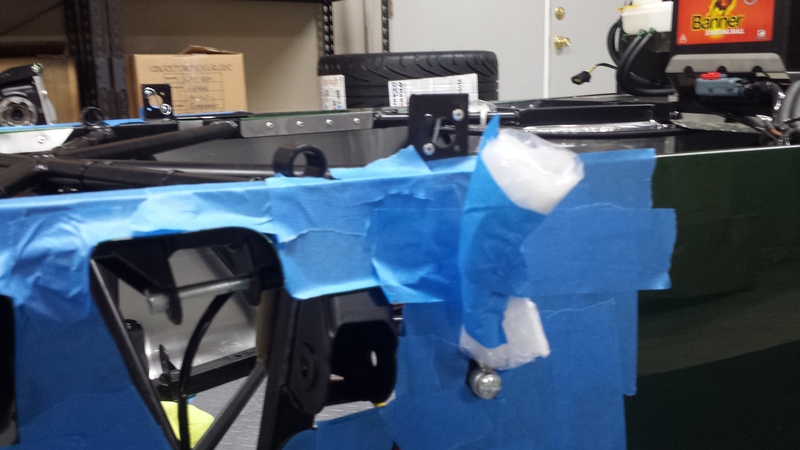 I did not, however, put tape through the edges of the cut suspension and steering rack holes because I was worried I wouldn’t get it back out and end up with remnants of blue tape on the car forever. Knowing what I know now I would have double or triple coated it. Wrenches have a habit of scratching anywhere you don’t have tape as if by magic. The second build tip would be to wrap the bonnet catches with foam and tape. I didn’t at first and the second time I bumped into them simply said that wasn’t going to do. Last thing I need is to scratch this thing up before I even get it on the road. 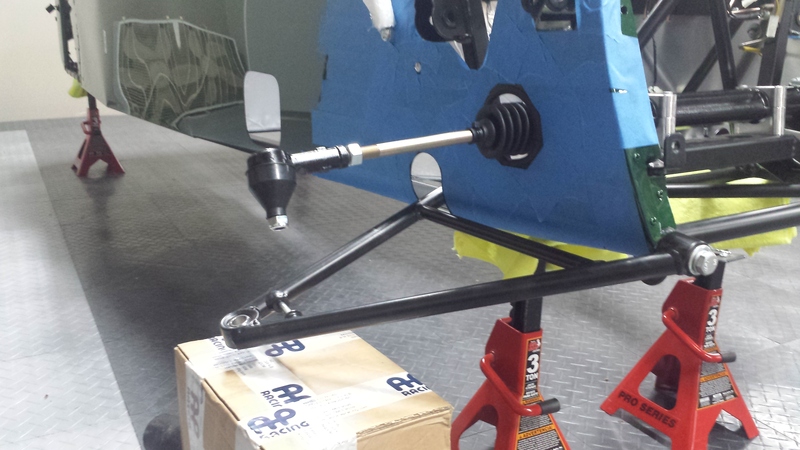 With the tape and foam in place, I moved onto the first real part – the steering rack. After staring at the manual for a few minutes trying to make heads or tails of the orientation, I slid it into place. But something didn’t look right. The little green rubber nub on the steering rack was in the right spot, but it didn’t line up with the steering box. I was under the assumption that those should line up. Had I put it on upside down or something stupid? So I pulled the manual page out and cocking my head left and right, up and down, it suddenly dawned on me the manual was written for a British right-hand drive car. The manual I had was not the US version, but the British one. So I pulled it out, flipped it around and sure enough, everything lined up as I expected. 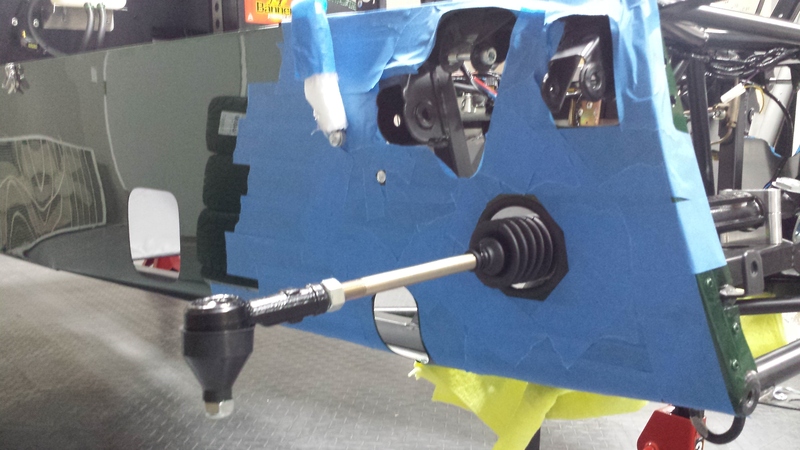 First learning moment complete – anything that’s oriented towards the drivers side needs to be reversed. Once the rack was in place (which took all of about 30 minutes to do something so simple) I had to find the steering rack clamps, bolts, and washers. After a little digging around, and by little I mean 30 minutes of searching in every damn box I had, I finally found the polythene bag marked suspension in the very last one. Pulled out the clamps, found the necessary bolt pack after a much quicker search, then through process of elimination found the right bolts and washers. 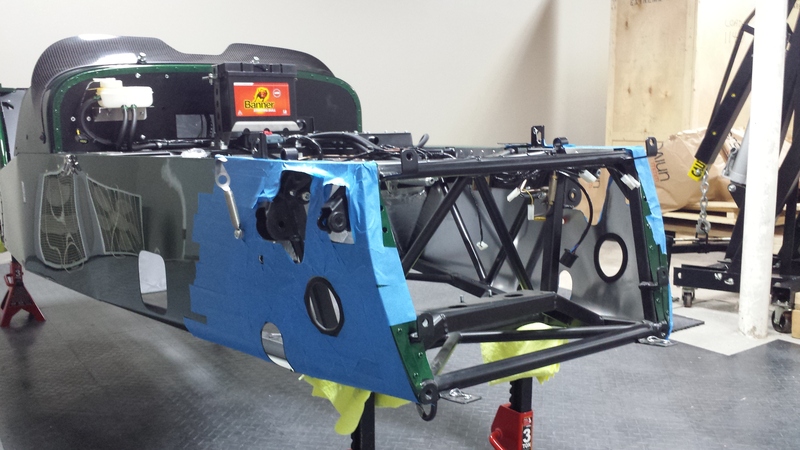 Loosely clamped the rack in place and attached the track rod ends. After getting that done I decided it was time for organizing the bolt packs a bit better so set off to do that but was quickly interrupted when the phone started ringing off the hook. Apparently there was some new computer vulnerability, something to do with the bash shell, and mass chaos was about to ensue on the internet. So with a sigh of resignation, I flipped off the light, trudged upstairs, and went to work. A few hours later, with the company’s response to the Bash ‘Shellshock’ vulnerability under control, I wandered back down to the garage. 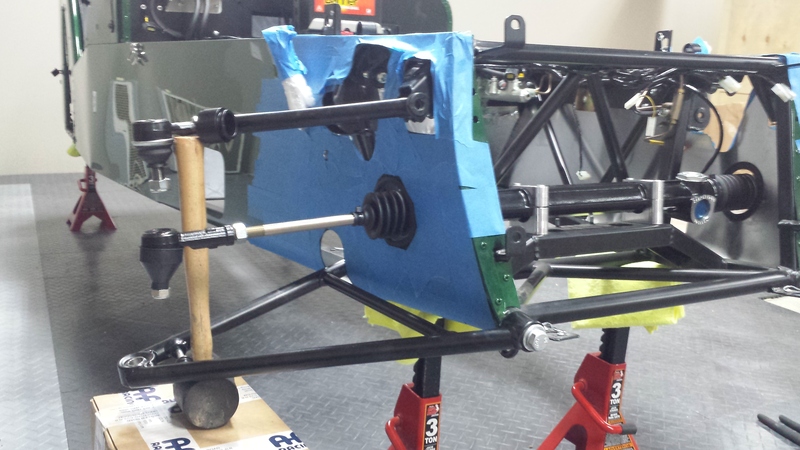 It was late, close to 10pm, but wanted to hit my goal of getting the front suspension on during build day 1. After skimming the manual a bit as a refresher, I’d already read it several times to let things sink in, I started gathering up the parts I needed from the boxes and set to work. It was during my haste that I interpreted LWR to indicate ‘left side’… which it most certainly does not. So with the lower wishbone in hand I began attaching it to the left hand side of the car. 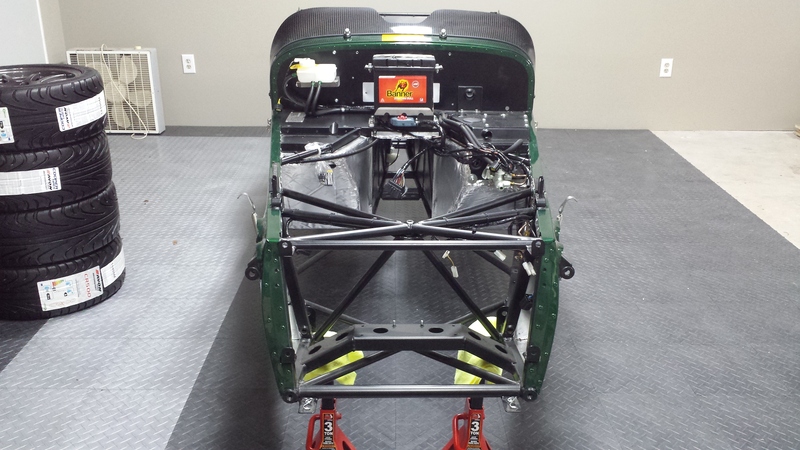 I can assure you the wishbones do indeed fit on the wrong sides of the car. It wasn’t until I was doing a double check for the missing left-hand lower wishbone that I realized the mistake. So … next step was to remove the right lower wishbone from the left side of the car and remount it properly on the ‘right’ side of the car (yuk, yuk, yuk). A flathead screwdriver and rubber mallet are your friends. The fitment was a bit tight and took several good whacks of the mallet to push the washers into the respective alignment to allow the bolts through. Wide track suspension needs 4 washers together on the rear lower wishbone mount rather than the 2 + 2; this is not indicated in the diagram. At first I was reading the manual PDF on my iPad directly going solely on the diagrams which is a mistake. Going directly on the iPad kinda works, but makes it difficult to use when you have anti-seize goop on your fingers. There are numerous spots in the manual where the diagram indicates the ‘normal’ way to do something, but on a later page you’ll find a statement that usually starts with “If you’re using the optional…” which changes how you did the previous step(s). The solution that I found to work best is to print off all the pages, then with a pencil (or sharpee or pen or whatever) cross out the sections which won’t apply to your build. It’s kind of like a choose your own adventure novel. Which in a way I guess this car is now. 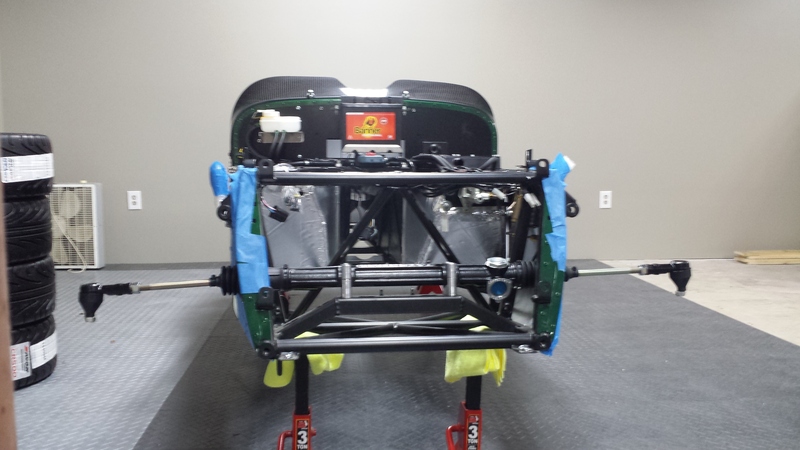 Once I had the lower and upper wishbones on loosely I peeked at the clock and realized I’d been down in the garage for 3 hours and it was after 1am. 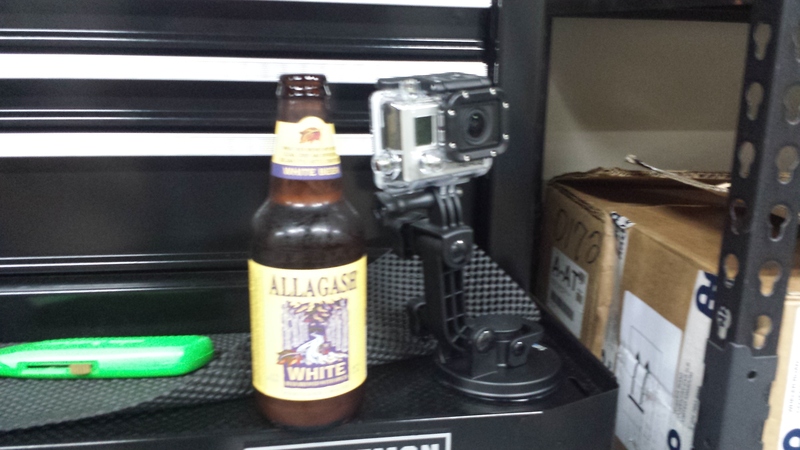 I finished off my Allagash, shut down the GoPro for the time lapse pictures, and decided to call it a night.